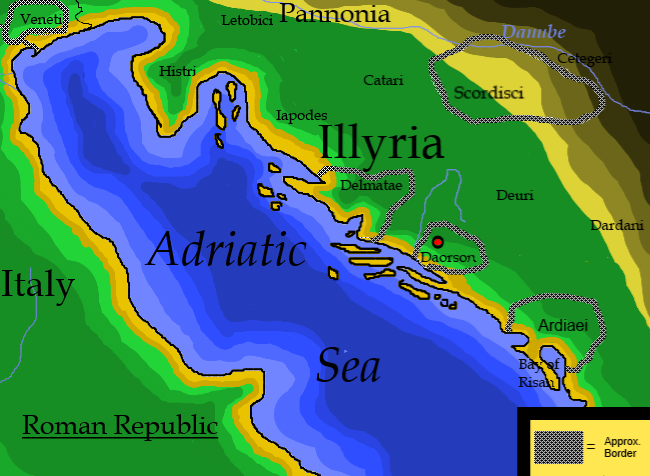 Illyria was a region in the western part of the Balkan Peninsula inhabited by the Illyrians. The prehistory of Illyria and the Illyrians is known from archaeological evidence. The Romans conquered the region in 168 BC in the aftermath of the Illyrian Wars. Under the empire, Illyria enjoyed a high degree of prosperity. It was traversed by a Roman road, and Illyria’s ports served as important trade and transit links between Rome and eastern Europe. Copper, asphalt, and silver were mined in parts of the region, and Illyrian wine, oil, cheese, and fish were exported to Italy. When in the 3rd century BCE the empire began to be threatened by the barbarian peoples of eastern and central Europe, Illyricum became a principal military bulwark of Rome and its culture in the ancient world. Several of the most-outstanding emperors of the late Roman Empire were of Illyrian origin, including Claudius II Gothicus, Aurelian, Diocletian, and Constantine the Great, most of whom were chosen by their own troops on the battlefield and later acclaimed by the Senate.